What says 'magic' more loudly than choosing the mystical and powerful Unicorn of Scotland as the country's National Animal? A country's 'National Animal' should represent the best, and defining, qualities of the nation who chose it. Scots have a strong sentimental streak under that practical and reserved exterior, and Scottish culture is rich in superstitions, myths and legends. So, choosing a heraldic symbol as awe-inspiring as the unicorn makes perfect sense! Chances are you don't know too much about this fantastic creature, so let's start there. 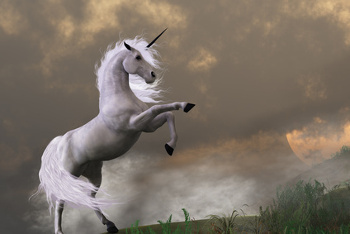 The stories and legends surrounding the Unicorn go about as far back in history as the human race. These beautiful creatures were worshiped by the ancient Babylonians, and written descriptions of them appear throughout ancient history, and as early as the first century AD. In the 5th Century AD, interpretation of a passage in the Hebrew Old Testament described an animal that scholars believed was a Unicorn. This may be the beginning of their association with Jesus Christ and the Virgin Mary, which is the basis for the legends that claimed only a Virgin could tame the Unicorn. 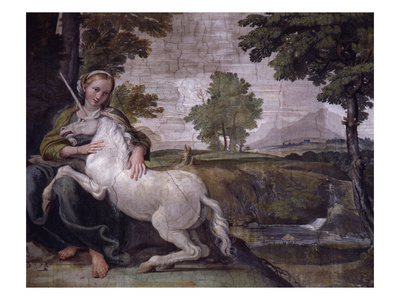 It could also explain the Unicorn's popularity in Christian Art, particularly during the Middle Ages. Unicorns were seen in the early writings and drawings of many different countries and cultures, including Greece, Persia (now Iran), Egypt, India and Africa. The Persians, the Romans, the Greek philosophers ,and even ancient Jewish scholars, all describe a horse-like creature whose single horn had magical properties that could heal any disease or illness. Not surprisingly, these stunning creatures were considered to be very rare and precious. They became a lunar symbol (ie symbolized the moon), and were given differing characteristics depending on the culture and country that was describing them. 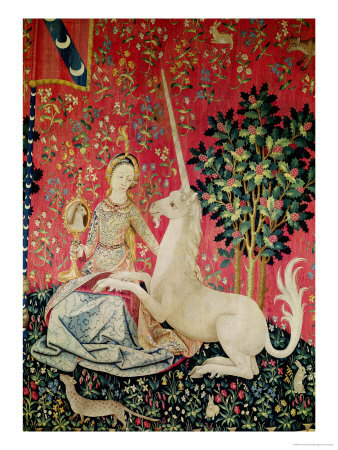 Although they're often thought of as imaginary, or purely mythical animals, the appearance of Unicorns in the history and writings of so many different countries, over many, many centuries seems to me to be more than imagination or coincidence. 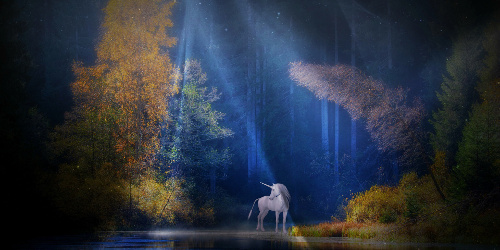 Even today, fantasy fiction and art is full of unicorn imagery, so that fascination continues. There are many weird and wonderful animals alive in the world today, and many that have become extinct (even in my lifetime). So, how hard is it to imagine a horse with a single horn? The superstitious and imaginative Scot in me believes that Unicorns may well have lived on Earth (and in Scotland) a long time ago. How about you? Unicorns have been associated with Royalty and heraldry since at least the time of the Romans, and over the centuries their appearance and personality traits have had more than a few 'upgrades'! They grew to become an exotic creature... a magnificent horse with cloven hooves, the tail of a lion, and a perfect spiraled horn in the middle of their foreheads. 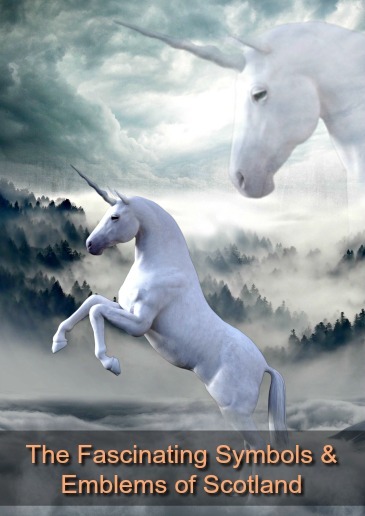 In Celtic Mythology the Unicorn of Scotland symbolized innocence and purity, healing powers, joy and even life itself. It was also seen as a symbol of masculinity and power. Two sides of the same coin as it were, a blend of male virility and female nurturing - perhaps the perfect mix! People also believed it to be a dangerous creature if running free. One that was impossible to capture alive - unless lured into an ambush by a virgin! You might notice that when he's featured on heraldic symbols, the Unicorn often has chains wrapped around him. This is a nod to this medieval belief that he was a dangerous creature. To a country as bold, fierce and proud as Scotland, one that was fighting for it's independence from 'oppressors' this was the perfect choice as the 'National Animal' that would appear on heraldic symbols. 'Some have made doubt whether there be any such beast as this or no, but the great esteem of his horn (in many places to be seen) may take away that needless scruple. It's not quite clear exactly when the Unicorn first appeared in Scottish heraldry, but one of the earliest examples is seen in the 'Royal Coat of Arms' at Rothesay Castle which is believed to have been carved sometime before the 15th century. 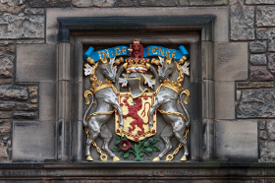 Before England and Scotland came under joint rule, Scotland's Coat of Arms featured two Unicorns supporting a shield (seem photo above). In 1603 the reigning King of Scotland, King James VI, also succeeded Queen Elizabeth 1st of England and become King James the 1st of England. This was known as the Union of the Crowns. 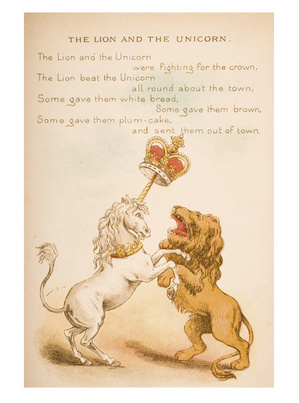 Although the new country of Great Britain did not legally exist for another century, this union seemed to require a new Royal Coat of Arms, and work began on creating the design you see today which features the Unicorn of Scotland on the right, and the English Lion on the left. The use of both symbolic creatures was supposed to symbolize the accepted union of the two countries. By now I'm sure you can see why this mythical creature is the perfect National Animal of Scotland. Hopefully you've also enjoyed learning a bit more about the magic and reality of this fantastic creatures' role in Scottish heraldry.